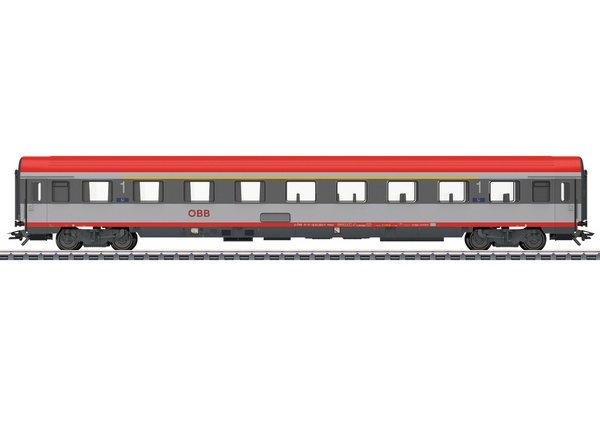 Prototype: Austrian Federal Railroad (ÖBB) type Ampz passenger car, 1st class. Modernized Eurofima car, not pressure-proof. The car looks as it did around 2012. New interior details with open seating and compartment area. Passenger cars to go with this car can be found in the Märklin H0 assortment under item numbers 42743 and 42744. An electric locomotive to go with this car can be found in the Märklin H0 assortment under item number 39849.